From the word, “rumakat” or “lumakad”, the Dumagats originated from the Negritos. It is assumed that they got their name from migrating by walking on land, rather than crossing the sea. They are a semi nomadic tribe, meaning, they have no permanent abode, but they stay in one place, going around the area, cultivating the land, harvesting their food, and leaving when the land is no longer fertile, letting nature take its course. They are usually found in the hillsides and mountains of Quezon, Rizal, and Laguna provinces, however, near the wooded land around Angat Dam in Bulacan, less than 3 hours from manila, the team found plywood houses, which can easily be destroyed by strong gusts of wind, no electricity, and no plumbing. This was the day of Trisports Solutions Inc.’s outreach to donate the old*, unclaimed finisher and event shirts to the Dumagats. Their community is made up of around 7 large families. 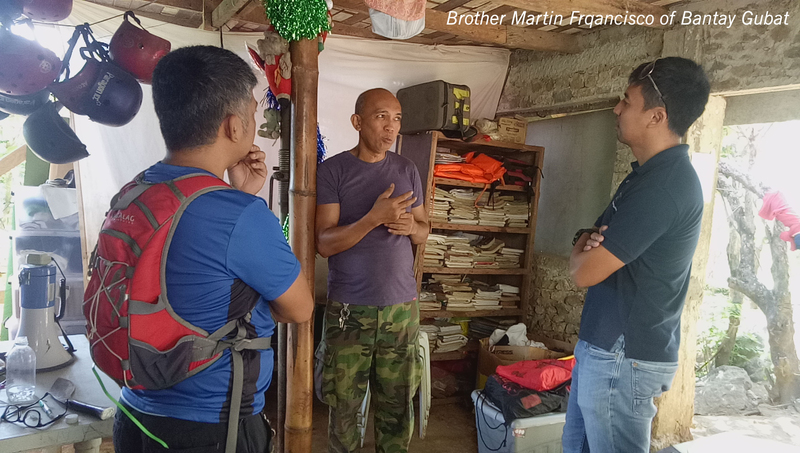 Our contact, Brother Martin Francisco of Bantay Gubat, acts as their barangay captain, taking charge of their education, both academic and livelihood, being the peacemaker between disputing families, and their connection to the “outside world”. 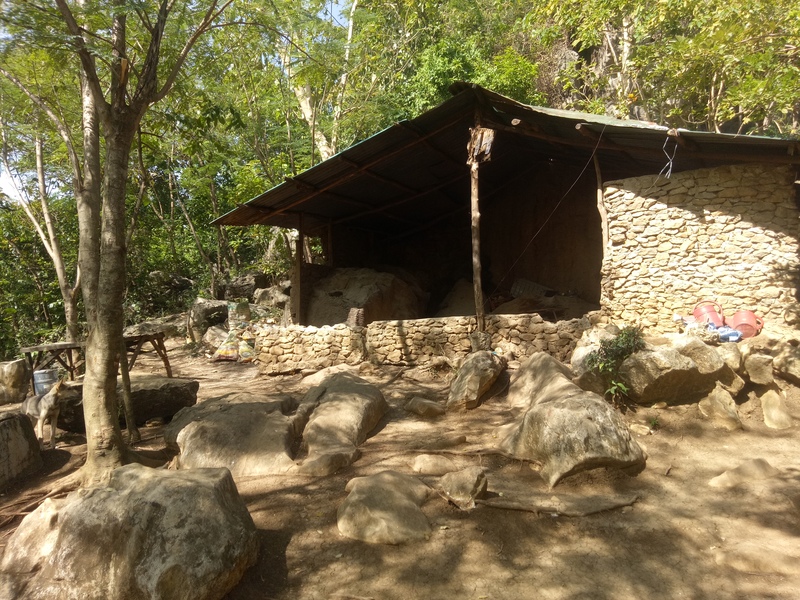 The Dumagats near Angat Dam, despite being so close to one of the most bustling and fast paced cities in the Philippines, are not exposed to money and the most basic commodities. Brother Martin believes that they should not be taught to be dependent on commercial items since they wouldn’t have any access to it in the long run. While there, the team found a community of happy, but shy people, excited to see visitors and spend the day with them. Stopping first at Brother Martin’s for a courtesy call, they learned that their families are very close knit and moves as one unit. If one member is called upon, you can bet everyone is gonna show up. They also have the patriarchal family structure, unlike most untouched people groups, with closed cultures, however, in their communities, it is the women who have confidence in conversing with outsiders, because they are the ones who get attend school. The main role of men are to go out and look for food, whether by harvesting or paying in order to borrow a boat and fish near the Angat Dam. 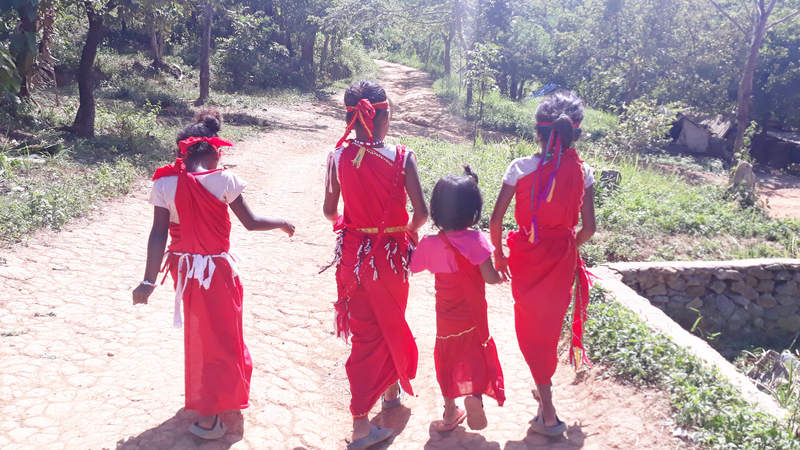 While the food is being prepared by the Dumagat women, the children presented a special song and dance number in their traditional outfits as their way of welcoming their guests. Next, the team taught the children to play Patintero, and they had so much fun, it wasn’t long until the teens, adults, and even elders joined in, as well. 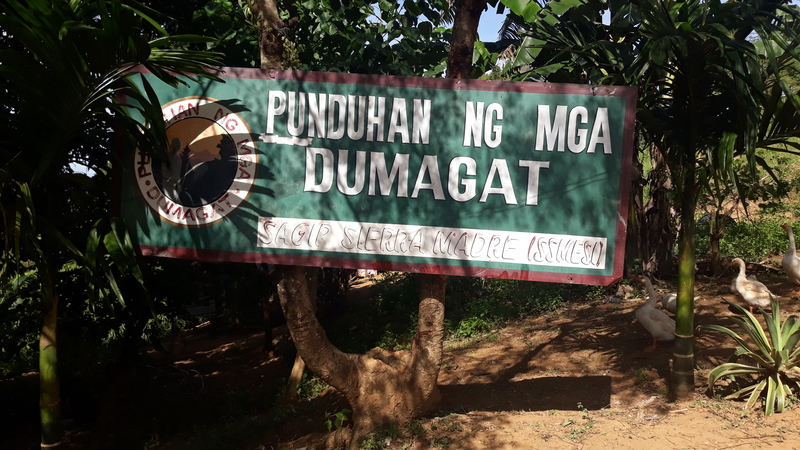 While everyone was resting, Brother Martin regaled them with the history of the Dumagats and the area, especially with how the people are protecting the environment which feeds them. After which, the team, together with the 70+ members of the community had a boodle fight, because if there’s anything that binds Filipinos together, it’s food. They had a feast pansit, chicken and pork adobo, and tilapia. At the end of the day, the old finisher shirts were turned over for distribution, however, the team left feeling like they had received something instead. There was quite nothing like creating unique relationships such as these. Seeing these people, who are so close, yet so far, in so many aspects, bonding with them, and making them happy, are the highlights of the trip, more than the cave exploring and rock climbing. Gale Tamon is a Marketing Officer of Trisports Solutions Inc.
Copyright© 2015 Trisports Solutions Inc. All Rights Reserved. 1. Completing the payment means confirming details are accurate and final. 3. Write the name of participant/s on the deposit slip/transaction receipt. For PAYPAL, forward paypal confirmation email. 4. Please wait for a confirmation email within 3 working days upon sending your proof of payment. 1. Deposit payment to: Account Name: Trisports Solutions Inc. In consideration of my entry, I, my heirs, executors and administrators release and forever discharge the Organizers TRISPORTS, its officers, staff, sponsors, servants, agents and subcontractors, instrumentalities, and all voluntary community groups, and all organizations assisting this event, producers, their agents and representatives of all liabilities, claims, damages or cost, which I may have against them arising out of, or in any way connected with my participation in this event. I understand this waiver includes claims based on negligence, action or inaction of any above parties. I fully recognize the difficulties of this event and declare that I am physically fit and able to compete in this event safely, and not have been told otherwise by a medically qualified person. Furthermore, I certify that I have secured for myself a life and accident insurance coverage up to the third party liability to answer for any damages or loss of life and property that may occur in this particular event. I agree that in the event of race cancellation due to storm, rain, inclement weather, wind or any other unforeseeable, or “act of God” conditions, my entry fee shall be non-refundable. I have carefully read this entry form and agree to abide by all rules and directions of all race officials on the day of the race. The Trisports Solutions Inc. reserves the right in the event of unforeseen events, inclement weather, emergency, or natural disaster or “any act of god” related matters to cancel the race or move to a later time. In the event of cancellation, there will be no refund of entry fees. I am the parent or natural guardian of the participant/s (“Child”) and have executed the foregoing Waiver and Release Agreement for and on behalf of my Child.I HAVE READ AND UNDERSTAND THIS WAIVER AND RELEASE AGREEMENT. In consideration of allowing my Child to participate in the Event, I agree thatTHE TERMS OF THIS WAIVER AND RELEASE AGREEMENT SHALL BIND ME, MY CHILD, our personal representatives, heirs and assigns.I HEREBY RELEASE AND PROMISE NOT TO SUE, AND SHALL DEFEND, INDEMNIFY AND HOLD HARMLESS, THE RELEASES’ FROM EVERY CLAIM AND ANY LIABILITY that I or my Child may allege against the Releases, including attorney fees, as a direct or indirect result of injury to me or my child, or me or my Child’s property, or resulting in my or my Child’s death, because of my Child’s participation in the Event or its staging, WHETHER CAUSED BY THE NEGLIGENCE OF THE RELEASES’ or otherwise. I/we attest to being fully trained and fit to participate and have full knowledge of the risks involved. I also give my permission for the free use of the participants name(s), photo and/or voice in any broadcast, telecast, print account or any other account in any medium of this event. The organizers own the images of participants taken from races and are authorized to use these images in promotional materials. At Trisports Solutions, Inc. (TSI), we attach great importance to your privacy. We intend to protect all personal information that we collect and process in relation with your registration and partnership with us. By joining our events or partnership with us, requires registration on our Online System, in which, provision of your personal information is necessary. This is within the scope of Data Privacy Act. In order to register with TSI, you may be invited to provide your full name, address, email address, date of birth and other sign up process information. By providing TSI with your personal data, you expressly authorize TSI to collect and process such data. Data or personal information may be used for internal analysis, marketing, demographic, operational purposes and other trends among our customers. You also agree that TSI may use “cookies” to help improve site management. You may block cookies by changing your browser settings. When you sign up and log in to our TSI Online website, through social media, some of your information is also being provided to us through that social media. If you do not want us to retain the information gathered, you can log in directly to our website using your TSI Online log in credentials. When you synchronize with other applications, you also willingly agree that data from other applications will be used and uploaded for TSI Online event monitoring such as location, speed, direction, time and date of an activity. And that TSI is not associated to any incident that may occur in your use of those applications. In principle, TSI will never transmit your personal data to third parties without your prior consent. When you register or sign up with TSI, you acknowledge and agree that TSIwill release names, age group, results and other event details in different media outlets. Your datamay also betransmitted to TSI’s subcontractors. TSI reserves the right to release your personal data if required by law. TSI will not authorize the use of your personal information for commercial or advertising purposes by third parties, except with your consent. Only important information regarding TSI activities will be shared to you by e-mail. You can let us know if you don’t want such service or information. TSI reserves the right to change any of the terms and conditions at any time.Your continued use of the site following the posting of changes will constitute your acceptance of such changes. We encourage you to review the policies whenever you visit our websites. In consideration of my entry, I, my heirs, executors and administrators release and forever discharge the Organizers TRISPORTS, its officers, staff, sponsors, servants, agents and subcontractors, instrumentalities, and all voluntary community groups, and all organizations assisting this challenge, producers, their agents and representatives of all liabilities, claims, damages or cost, which I may have against them arising out of, or in any way connected with my participation in this event. I understand this waiver includes claims based on negligence, action or inaction of any above parties. I fully recognize the difficulties of this challenge and declare that I am physically fit and able to compete in this challenge safely, and not have been told otherwise by a medically qualified person. Furthermore, I certify that I have secured for myself a life and accident insurance coverage up to the third party liability to answer for any damages or loss of life and property that may occur in this particular event. I have carefully read this entry form and agree to abide by all rules and directions. I am the parent or natural guardian of the participant/s (“Child”) and have executed the foregoing Waiver and Release Agreement for and on behalf of my Child. I HAVE READ AND UNDERSTAND THIS WAIVER AND RELEASE AGREEMENT. In consideration of allowing my Child to participate in the Challenge, I agree that THE TERMS OF THIS WAIVER AND RELEASE AGREEMENT SHALL BIND ME, MY CHILD, our personal representatives, heirs and assigns.I HEREBY RELEASE AND PROMISE NOT TO SUE, AND SHALL DEFEND, INDEMNIFY AND HOLD HARMLESS, THE RELEASES’ FROM EVERY CLAIM AND ANY LIABILITY that I or my Child may allege against the Releases, including attorney fees, as a direct or indirect result of injury to me or my child, or me or my Child’s property, or resulting in my or my Child’s death, because of my Child’s participation in the Challenge or its staging, WHETHER CAUSED BY THE NEGLIGENCE OF THE RELEASES’ or otherwise. I/we attest to being fully trained and fit to participate and have full knowledge of the risks involved. I also give my permission for the free use of the participants name(s), photo and/or voice in any broadcast, telecast, print account or any other account in any medium of this event. The organizers own the images of participants taken from races and are authorized to use these images in promotional materials. Thank you for signing up for Turbo Sprint 2019 happening on August 11, 2019 at Vermosa. You’re done with STEP 1 – fill up and submit. Perform STEP 2 – pay and send proof of payment to trisports.solutions@gmail.com within 3 working days, to complete your registration. Account Name: Trisports Solutions Inc.
MAKE YOUR REGISTRATION OFFICIAL NOW! Thank you for signing up for RunOn happening on October 15 to 29, 2018. Thank you for signing up for Biathle 2019 happening on September 8, 2019. Thank you for signing up for Manila Polo Club Aquathlon 2019 happening on June 30, 2019. Thank you for signing up for Tigasin Triathlon and/or Open Water Swim happening on May 5, 2019 and May 4, 2019 respectively. Thank you for signing up for TINMAN7 happening on March 17, 2019 at Currimao, Ilocos Norte. Thank you for signing up for DuathlOn happening on September 15 to 29, 2018. Thank you for signing up for Trisports RunOn Weekend happening on November 24 to 25, 2018. Thank you for signing up for R150K-30D happening on January 2 to 31, 2018. Thank you for signing up for TINMAN7 – Open Water Swim happening on March 16, 2019. Thank you for signing up for Open Water Swim Clinic with Coach Jenny Guerrero happening on March 30, 2019. FOR CYCLING JERSEY Add On, click here to pay.